Artist's rendering of NASA's Orion Multi-Purpose Crew Vehicle on a deep space mission. CAPE CANAVERAL Fla. — The announcement today of an ambitious new project to launch the first private manned mission to Mars in 2018 may suggest to some that NASA has lost a step in the pursuit of deep-space exploration. But the U.S. space agency is forging ahead with plans for a flexible new spaceship and rocket to send astronauts deeper into space than ever before. The nonprofit Inspiration Mars Foundation unveiled plans for a private Mars flyby mission today (Feb. 27) that calls for a January 2018 launch of a two-person crew — a man and woman, possibly a married couple — on a 501-day trip to the Red Planet and back. 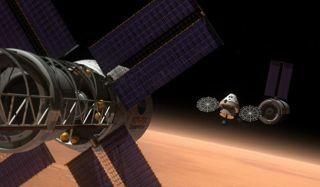 The mission would not land on Mars but bring a capsule and inflatable module within 100 miles (160 kilometers) of the Martian surface before zooming away back to Earth. Just one hour after the Inspiration Mars Foundation announcement in Washington, D.C., NASA officials here at the Kennedy Space Center briefed reporters about the agency's own plans for deep-space missions, including an eventual Mars trek. "We know we're eventually going to Mars, and there are multiple destinations between here and Mars," Dan Dumbacher, NASA's deputy associate administrator for exploration systems, said in a briefing that did not address the private Mars project. Orion and the SLS form the core of NASA's deep-space exploration program. In 2010, President Barack Obama set a lofty goal for NASA's future — send astronauts to an asteroid by 2025, then take aim at a manned Mars mission in the 2030s. The aerospace company Lockheed Martin is building the four-person Orion capsule for NASA, with the European Space Agency providing the service module for the spacecraft. Orion's first test flight, called Exploration Flight Test 1, is slated to launch in 2014, and parts of the space capsule are being assembled at the Kennedy Space Center now. Once the computers are in place sometime this summer, NASA scientists will power on the test capsule for the first time and check its systems on the ground, Orion project manager Mark Geyer said. The NASA team plans to launch the capsule atop a Delta 4 rocket, sending it 3,000 miles (4,828 km) above Earth's surface. The main goal is to test the heat shields tasked with protecting crewmembers during Orion's manned missions, the first of which is slated to launch toward lunar space in 2021. NASA's first SLS flight — the unmanned Exploration Mission 1 — is due to launch in 2017, officials said. Currently, various components of the rocket are being built around the country. Starting in 2016, hardware is expected to begin arriving at the Kennedy Space Center for testing and assembly. Orion and the Space Launch System won't launch together at first, but data from both flight tests will be used to help NASA scientists learn what improvements may be needed for each of the vehicles to boost safety and efficiency, project officials said. "You want to make sure you've flown in that environment before you put anyone on board," Geyer said. Scientists will also test Orion's launch abort system during a separate test after the 2014 launch. Like NASA's Mercury, Gemini and Apollo capsules, the Orion spacecraft features an abort system designed to separate the capsule from its rocket during an emergency to carry its crew to safety. The agency's space shuttles had no such system. During the launch abort test, NASA plans to stress the Orion capsule to its limits to replicate the conditions astronauts might experience in the case of a malfunction. The spacecraft will be ripped free of its booster and propelled 1 mile (1.6 km) away to safety through a series of intricate maneuvers performed by its abort system. NASA is also preparing the ground facilities at Kennedy Space Center for the future missions. The Orion test flight will be run from a new firing room at the Launch Control Center, and NASA officials will be awarding a contract to a company that will reconfigure some of the structural models on the ground for the new rocket, explained Pepper Phillips, NASA's ground systems project manager.